Only a single work, some three quarters of an hour long; Schubert's last quartet (or was it the Tokyo Quartet?) attracted a full house + standing to Wigmore Hall for the hugely successful BBC Luchtime Concerts series. We were rewarded with an immaculate account of this usually demanding, indeed punishing work. In my younger days I recall it (and Brahms' first quartet) being criticised as too "orchestral". There is an opposite problem nowadays; ought the late Beethoven quartets, including the Grosse Fuge, and this last of Schubert's, to have become so "easy" that many groups can toss them off without showing signs of strain or exhaustion at the end? Have we thereby lost an intrinsic element of the music? Misha Donat, in his analytic note, stressed the quartet's unsettling vacillation between major and minor, with outbursts of almost manic violence, relieved by "Mendelssohnian transparency" in the Scherzo. Stephanie Hughes, introducing the Tokyo String Quartet for the radio, added a mention of the feature which always had struck me more; the relentless use of tremolando in the texture, continually throughout many of the pages of D887. That was somehow 'taken for granted' by the Tokyos without making much of its unusualness. Their approach was always forward moving, and I doubt whether their tempi were slower than their competitors on CD? Was the emotional impact less than sometimes? What was especially striking was how they completed what can be a daunting task without apparent strain, in a performance which left the multi-national and not young players looking 'fresh as a daisy' at the end, so that we were surprised to have no encore offered. The rich and homogeneous sound quality from a group whose personell had changed over the years (only violist Kazuhide Isomura the sole remaining founder member) was remarkable. 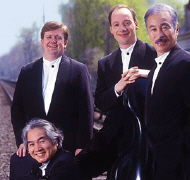 It clearly owes much to their instruments - the Paganini Quartet set of Strads, owned by the great virtuoso, on indefinite loan from the Nippon Music Foundation to the Tokyo Quartet. There are essentially two approaches to playing the classical string quartet repertoire, which one may caricature as extravert and introvert. The first is about projection, virtuosity, freshness and making light of technical difficulties or intricate textures; the second tries to explore the profundities of this most intimate of all musical forms. Stereotypically, the first approach is New World , and the Emersons are its most celebrated present exponents, the second derives from the original European tradition – one might cite the Hungarians or the Veghs. Although this polarisation is too simple, (for example, there was the irrepressibly cheerful Quartetto Italiano) it is indeed hard to keep both virtues in mind- to play every score with the energy of discovery, of the first time, and also to give the listener a route into its depths and complexities. Schubert's late G major, written in a happy key but with periodic intimations of frustration and mortality, benefits from both approaches; this interpretation by the much-celebrated Tokyos was smooth and lissom in the extreme, more spring-like than reflective, lyrical and sunny (listen to how easy and flowing the Laendler trio sounds). Overall, this was one of the prettiest, lightest and most positive interpretations of the work I have ever heard, overflowing with felicity and delight in the writing (listen, for example to the passagework end of the scherzo). Unlike the so-called Rosamunde and Death and the Maiden quartets, there is no obvious sunny or gloomy indication as to how to play D887. So conversely, the Tokyos' choice of approach deprived us of much of the edge and bite I also associate with this work. The finale was so relaxed as to be almost timid, there was little hint that the slow movement might be an anguished meditation. While hoping not to fall into a further stereotype, Uchida's Schubert piano works would be an apposite comparison – affectionate, faithful, meticulously detailed, and never angry. In any case, the Tokyos were firmly on the ‘Emerson' side of the camp, although their projection was always controlled, never for show. Surprisingly, the ensemble and intonation were not quite perfect, with one glitch at the start of the first movement development, and some uncertainties in the high treble register in the finale. Overall, a performance that could not have been more beautiful, but resisted sublimity. This fascinating performance can still be heard at home on BBC R3 Listen Again until Sunday.